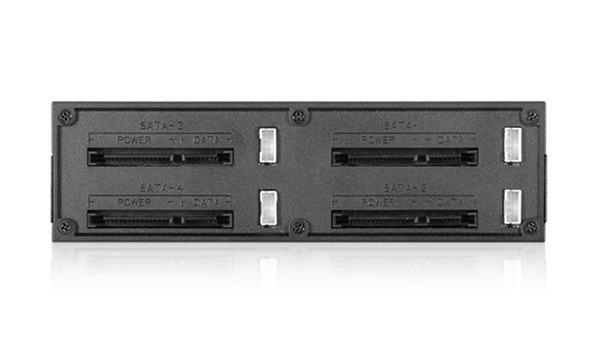 The iStarUSA BPN-124K-SA helps fit four 2.5″ drives into a single 5.25″ drive bay. One of the nice features of this hot-swap backplane is that the iStarUSA BPN-124K-SA is trayless. What that means practically is that all drives can be directly inserted into the backplane without the need to screw drives into trays. This can easily save five to ten minutes on installation of all four drives and precious minutes when it comes to replacing failed drives. We used our standard test bed for hotswap backplanes. It is likely we will move to a new configuration in 2H 2014 to update specs slightly. 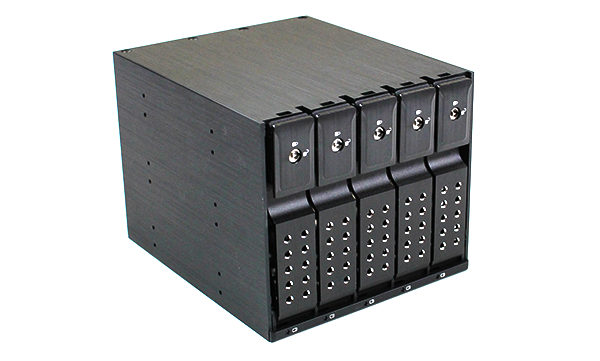 Overall, the iStarUSA unit is suited to just about any 5.25″ drive bay. 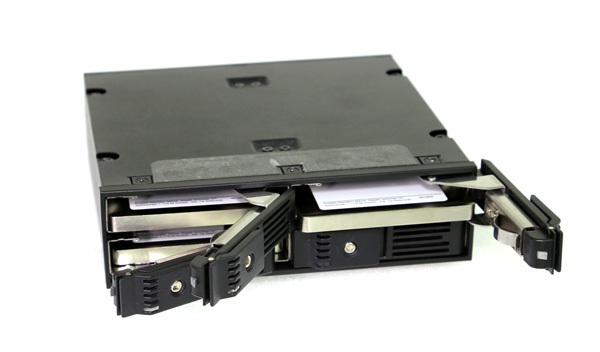 There are two principle ways that drives are secured in these types of hot swap enclosures (or backplanes): with or without trays. The primary difference between these two methods is whether the latching mechanism is connected to the individual drive via a tray or it is connected to the enclosure. When the latching mechanism is connected to the enclosure, no drive tray is needed. As a result, the user can simply insert drives without securing a tray with screws to a new drive. There are varying opinions on whether the trayless or with tray versions are better. iStarUSA includes individual drive latch locks which is important in trayless enclosures. As one can see inside the chassis, each bay in a trayless design has a spring/ push mechanism that will push drives out when the latch is opened. As a result, trayless designs should ideally all have door locks, like on this unit, to prevent accidental removal. The iSTARUSA BPN-124K-SA is made of black ABS plastic as well as metal. The main chassis is metal with the front panel being made of both ABS plastic and metal. At first I was concerned with the durability of this setup, however just to test I tried each drive spot 250 times and they all continued to perform well. In fact, after maybe two dozen actuations they may have become smoother to operate. With the iSTARUSA BPN-124K-SA there are four power and four SATA connectors on the rear of the unit. Each power and data pair drives one of the four drives. This is different from many enclosures that have one or two power connectors with each power connector driving multiple drives. There are no Mini-SAS (e.g. SFF-8087) or SATA + SAS connectors. 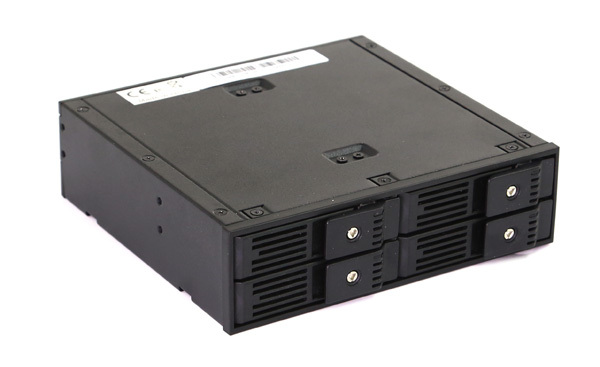 The BPN-124K-SA is strictly a SATA I/ II/ III enclosure. One major area of note is that there is no internal fan with the BPN-124K-SA. Other trayless units have fans which provide better airflow. With no internal fan there is no noise, vibration or extra power consumption. Testing with SSDs found sufficient airflow from chassis fans, but one should check for their application. The iStarUSA BPN-124K-SA does not have a fan. This has two principal advantages. First, it means that the unit does not make any noise during normal operation. Second, without a fan there is no associated power draw. While we normally test for these, the BPN-124K-SA did not have any noticeable impact on power consumption (<1w in our tests.) In terms of performance, we utilized Samsung 840 Pro 256GB drives secure erased. We tested the drives both directly connected to the motherboard port and through the backplane. What we found was that the impact of the backplane was not noticeable. Each test was within 3MB/s which is within a normal testing variation we see in the lab. Overall the iSTARUSA BPN-124K-SA worked well. As an aside, I do prefer trayless units. They save a few minutes when swapping drives. The drive activity indicators are a great feature. The door latch locks are an important feature every trayless hot swap backplane should include. For low power SSDs and chassis with decent cooling, this BPN-124K-SA is an excellent solution to lower power consumption, noise and vibration. I could see this for SSDs but not mechanical disks.